FILE - A bag of 4-fluoro isobutyryl fentanyl which was seized in a drug raid is displayed at the Drug Enforcement Administration (DEA) Special Testing and Research Laboratory in Sterling, Virginia, Aug. 9, 2016. Organized crime groups are expanding and diversifying drug production in Southeast Asia's Golden Triangle amid fears the region could emerge as a hub for synthetic opioids like fentanyl, according to the United Nations Office on Drugs and Crime (UNODC). Asia Pacific counter-narcotics police met in Myanmar's capital Naypyitaw on Wednesday to negotiate a new strategy to strangle the supply of chemicals used in synthetic drug production. 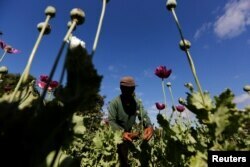 The Golden Triangle centered on Myanmar's conflict-ridden north has exported illicit drugs to the world for decades. While opium cultivation and heroin trafficking has slumped in recent years, synthetic drug manufacturing - especially methamphetamine - has soared. FILE - A man harvests opium as he works in an opium field outside Loikaw, Kayah state, Myanmar, Nov. 30, 2016. UNODC regional representative Jeremy Douglas said the boom was "like nothing we have ever seen before, and it has required a matching surge in precursor chemicals." "We have seen drug syndicates in the Golden Triangle scale-up methamphetamine and add ketamine to their repertoire. There is increasing concern amongst officials here that they will soon go into manufacturing synthetic opioids," Douglas told Reuters. "Given their sophistication, we think it is only a matter of time they do it. They are ruthless and the region has the conditions necessary for production and pre-existing market demand to capitalize on." he told Reuters. China, along with Mexico, is the major supplier of extremely potent opioids to North America, according to the U.S. Drug Enforcement Administration (DEA). The DEA said in a report last week the country was gripped by an "ongoing fentanyl epidemic." Myanmar's surge in methamphetamine production followed the China crackdown.